latest thing: Can You Digg It? With so many blogs, news sites and e-mail newsletters inundating Internet users on a daily basis there has to be a simpler way to sift through it all. Digg.com is attempting to provide a site that does just that. About a year ago websites all over the Internet began to offer their users the ability to "tag" pages. Taggining requires users mark their pages using descriptive words and phrases. Users then who use similar or like words and phrases are linked together, creating a natural network. This network makes it easier to connect users who share similar interest. Yet, it still requires users to sift through pages and pages of content to find something worthwhile. Digg, however, is changing this. According to Digg.com "Digg is a technology news website that combines social bookmarking, blogging, RSS, and non-hierarchical editorial control. With digg, users submit stories for review, but rather than allow an editor to decide which stories go on the homepage, the users do." A digg is simply a user giving a story the OK. Such a system is empowering the sites visitors to choose which stories are worth reading. The more "diggs" a story gets the higher it ranks on the site. 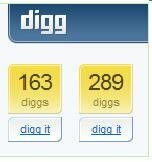 Digg.com is also looking to replace the more dated Internet ranking systems. Digg simplifies rating something by eliminating the ambiguity of starred or numbered systems. Honestly, what is the difference between 3 and 4 stars or a 2 or 3 rating. Giving users the ability to simplify how they rate stories, while at the same time making it simpler to sort through all the articles that aren't worth reading. Currently Digg only accepts stories that are technolgy related, but they are planning to expand into other popular categories like celebrity gossip, politics and news. Since Internet users are faced with information overload from all aspects of the media, making it simpler when it comes to finding relevant and interesting news stories is a solid idea. Digg.com allows a substantial amount of interactivity, which will help in enticing users to visit the site. Because users are able to control the content, it will be easier with similar interests to navigate the Internet. Pop Culture Make Me Smarter?